With just five months to go for the official opening of Legoland Dubai in October this year, the theme park has added another proverbial brick in the wall by unveiled its latest attraction, Lost Kingdom Adventure. “Lost Kingdom Adventure, is yet another significant addition to the list of attractions at Legoland Dubai, which is the first of its kind in the region. We are confident that this fun-filled interactive experience will be a great hit with Dubai Parks and Resorts’ visitors, especially our younger guests as it’s packed with some of the best-known Lego characters.” said Raed Kajoor Al Nuaimi, CEO of Dubai Parks and Resorts. Emirates 24|7 had reported in March that even as the park is scheduled to open in October, a soft opening before that month will offer select residents and visitors access to the park’s rides and attractions as part of its pre-opening activities. With this latest announcement, the park takes another step closer to completion. The family carriages of the new indoor ride – located in Adventure, one of the park’s six themed lands – are equipped with high-tech laser blasters. Designed to represent the ruins of an ancient, fictional Egyptian temple, the ride’s storyline encourages young explorers to go on an escapade through ruins to recover a pharaoh’s stolen treasure. “We’re excited to unveil the Lost Kingdom Adventure,” says Siegfried Boerst, General Manager of Legoland Dubai. “Having a mix of indoor and outdoor elements, it is the perfect year round attraction. As we draw closer to our October opening and the finishing touches are completed, we look forward to continuing to share more details about what will be the ultimate theme park for families and children in the region,” he said. Legoland Dubai, together with Legoland Water Park, is part of Dubai Parks and Resorts which will also feature motiongate Dubai – a unique theme park showcasing some of Hollywood’s most beloved characters from DreamWorks Animation, Sony Pictures Studios and Lionsgate. 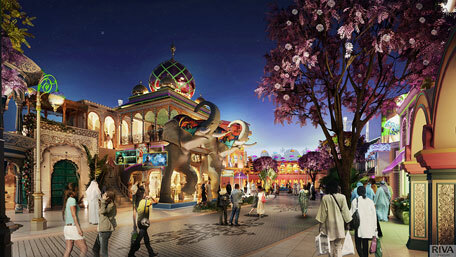 Dubai Parks and Resorts will also feature Bollywood Parks Dubai, the first ever theme park based on the sights and sounds of Bollywood. The entire destination will be connected by Riverland Dubai – a retail, dining and entertainment walkway and guests can stay at the Lapita Hotel, a Polynesian-themed resort catering to families.